All Men Are Brothers. It is a selection from the writings of Mahatma Gandhi compiled for the UNESCO, for presenting in one handy volume, the life and thoughts of the Mahatma as told in his own words. The UNESCO publication is in English, to be followed by French and Spanish editions. As all know, copyright in Gandhiji's writings vests in the Navajivan Trust. Therefore the UNESCO, through the Government of India had approached the Trust for permission to publish their selections from Gandhiji's writings in book form. The Trust had very gladly given them this permission. Accordingly, the book was out by the end of 1958 and has by now run into four impressions. 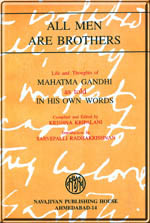 The Navajivan Trust thought that a cheap edition for readers in India, of this important publication from Gandhiji's writings, might be a welcome thing, and hence the Trust approached the UNESCO for permitting the issue of a cheap edition in English and in Indian languages also, with Dr. Radhakrishnan's Introduction. The UNESCO has kindly granted us this permission. Hence this issue of the book for Indian readers. The Trust thanks the UNESCO for this permission. The book is entirely a reprint of the UNESCO publication minus the interesting pictures it contains. We have given only one picture as frontispiece, which has made it possible for us to reduce the price appreciably. At its ninth session, which was held in New Delhi in November 1956, the Unesco General Conference adopted, on the proposal of the Delegation of Uruguay, a resolution authorizing 'the Director-General to arrange for the publication of a book containing selections from Gandhi's thoughts preceded by a study of his personality'. The General Conference wished thus to provide an opportunity for Unesco to pay homage to both the person and the writings of a man whose spiritual influence has extended throughout the entire world. The texts have been selected to appeal to a wide public and are intended to illustrate and make better known the different aspects of Gandhi's personality and writings. H. E. Sir Sarvapalli Radhakrishnan, Vice-President of India, has kindly accepted to write a short introduction which describes the main features of the Mahatma's philosophy and his influence in furthering friendship and understanding between peoples. Unesco is greatly indebted to H. E. Sir Sarvapalli Radhakrishnan for his highly valuable co-operation, as well as to those Indian authorities who collaborated in the preparation of this book. Special tribute is also paid to Shri K. R. Kripalani, Secretary of Sahitya Akademi, for his highly competent assistance. It is planned that the present publication in English will be followed by French and Spanish editions.